On Wednesday, the last day of the Sukkot festival, a 34-person delegation from West Papua presented a large amount of gold to be used in the building of the Holy Temple. 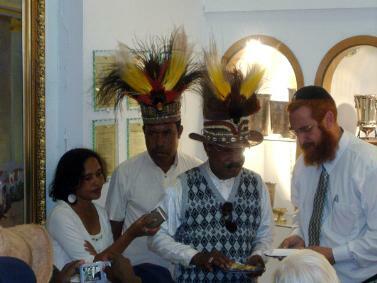 The delegation from West Papua presents the gold for the Holy Temple to Rabbi Yehuda Glick, director of the Temple Institute. The delegation, including representatives of the nation’s government, explained that they study the Bible regularly and recently came upon a verse in Zecharia (6:16) reading “And the distant ones will come and build the Temple of G-d.” They discussed the passage among themselves and decided that their faith obligates them to fulfill the verse. West Papua, located in the southwestern Pacific Ocean, is rich in gold mines, so the delegation thought it natural to donate gold for the Holy Temple. The Holy Temple will be built in the place where the First and Second Temples once stood – on Jerusalem’s Temple Mount. The group heard of the Temple Institute in Israel, which deals with advancing the building of the Temple, and on Hoshana Raba - the 7th day of Sukkot - the delegation arrived at the Institute's headquarters in Jerusalem’s Old City and presented the gold to Rabbi Yisrael Ariel, a founder of the institute, and Yehuda Glick, its director. The group presented a kilogram of gold and a large sum of money. They requested that the gold be used to construct vessels for the Temple and that the funds be used by the institute for any purpose it sees fit. The institute has a fund set aside for exclusive use for the actual construction of the temple, as well as funds for building the vessels and engaging in educational projects. Rabbi Chaim Richman of the Temple Institute and Israel National Radio, said that, in view of the Halakhic problems that could be caused by specifically consecrating money and gold for the Holy Temple, an escrow account was opened, including a safe deposit box for all donations explicitly set aside for use in building the Temple. Delegation members said that although this is their first contribution for the Temple, it will certainly not be their last. “They said that in Papua there are fine trees that they hope to one day bring aboard a ship to Israel in order to be used in the building of the Holy Temple," the rabbi said. The Temple Institute was established twenty years ago, and deals with research and education about the Holy Temple. The institute has published dozens of books and has prepared more than 70 of the gold, silver and copper vessels needed for Temple service. Just two weeks ago, the institute completed a large “King David’s Lyre.” Its craftsmen are working now on the golden headpiece worn by the high priest. Some of the vessels prepared by the institute for use in the Temple include the golden menorah (candelabra), the show-bread table, the golden altar, Levite musical instruments and priestly clothes. The vessels are on display at the institute's headquarters on the Old City’s Misgav Ladach street.